THE VOICE: Returns to the Set with Disappointed Fans! NBC’s singing competition show that judges how a singer sounds and not how he or she looks “The Voice” is back in production for season 2. Filming started at the Sony Studios lot in Culver City last Friday, October 21st. Our reporter was there and this is his exclusive report! “The Voice” had a lot of disappointed fans on Friday who came to see what they thought was going to be a performance of judges Cee Lo Green, Christina Aguilera, Blake Shelton and Adam Levine. What they got were pick-up shots of the judges. The judges performance was cancelled because, according to audience company 1iota, production had to finish with the studio due to a movie shoot. The fans who were “ticket holders” were promised “priority seating” next time with a raffle that will consist of iPads and cash as prizes. The audience was still not happy because they were expecting performances from the judges and what they go was no singing at all. “The Voice” has managed to start-out season 2 the same way it started the first season. There were many disgruntled fans on the first day of filming for season one after three hours of just waiting outside. Fans also did not get a live performance from the judges that day as they had expected. One of the explanations heard given at that time was that Aguilera was not feeling good. In other “The Voice” news, the show has kept the set the same as viewers will remember it from the first season. 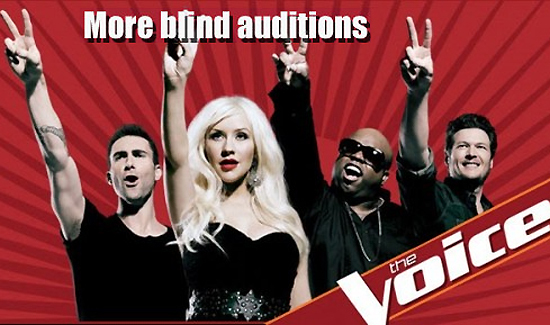 Filming of the show’s “blind auditions” start this week! Check back here for more updates on season 2 of “The Voice”.